It's the 1st of July and time for another challenge over at Country View Challenges. The theme is 'Things with Wings' and as I am in a very vintage mode at the moment I decided to use the paper dolls and make my own wings to add to these two cute girls. Paint a piece of thin card with white tinting base to seal it. Dip in watery washes of titan buff and medium grey v6. Sponge over some white tinting base and gently shake some vintage glitter powder over it and heat set it. 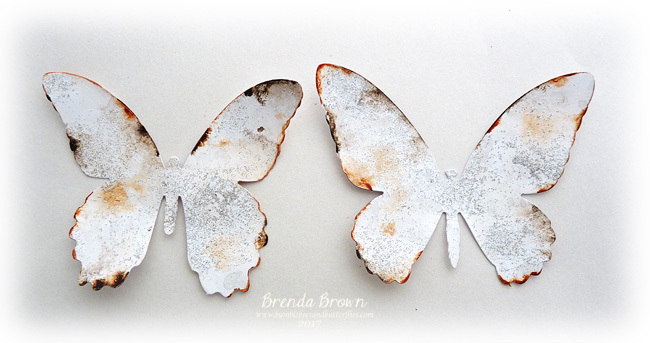 Take the butterfly die-cuts, spritz them with water and with a tiny paint brush gently pull quinacridone gold and raw umber round the edges of the wings and drip the most tiniest amount in a couple of random places and heat dry. Take your chosen vintage photo and add the wings. I also added a small amount of quin gold to the girls as well. 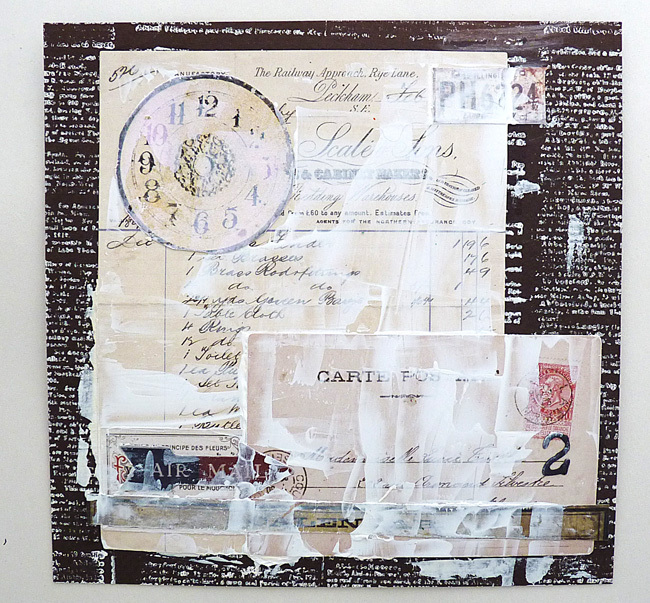 Stamp dictionary text onto brown card, create a collage over it and scrape some white tinting base over with a palette knife. Paint over with ultra matte varnish or matte medium to seal it before then dribbling raw umber, quinacridone red and paynes grey around the edges of the collage pieces, spritzing with water and drying to create the aged look. Gather together some embellishments, dip them, paint them and age them. The shadowbox is made of light wood so I sanded it roughly all over and then gave it a coat of raw umber and titanium white antiquing cream, keeping them separate colours to put onto the wood and blended them on there so I got light and dark contrasts as well as the blended hues between. I used my finger to rub the colours onto the front of the frame and then used a wet paint brush to colour the outside. I took a damp babywipe and gently knocked it back a little and left it to fully dry. 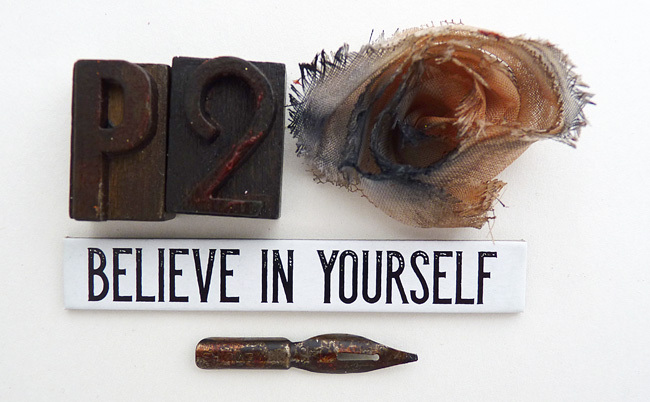 Then I sanded where I wanted to see some wear and tear and used a blending tool and ground espresso distress ink. To finish off I used a small piece of kitchen scourer sponge and using the scouring side I lightly rubbed some more of the white antiquing cream over the top to create a more shabby look. I realised as I was doing it I could quite as easily used the tinting base or titanium white media acrylic which would have been more permanent - but after it dried a light coat of matte medium sealed it beautifully. I always try to ground people when they are standing upright so they don't look as though they are floating in mid air, today I used a quote chip for that purpose. All paints and mediums are from the DecoArt Media range. Thanks for stopping by and we look forward to seeing you enter a project over the next four weeks. Difficult to believe it's all brand new items in that make! Great tutorial Brenda and I picked up some aging and distressing tips (sounds odd when I say it out loud, but you'll know what I mean!). Fabulous project. Love how you've achieved such an aged look to everything. A fabulous piece. Absolutely stunning Brenda and a great "how to"! Vintage perfection, these two just look glorious with their home made wings!! 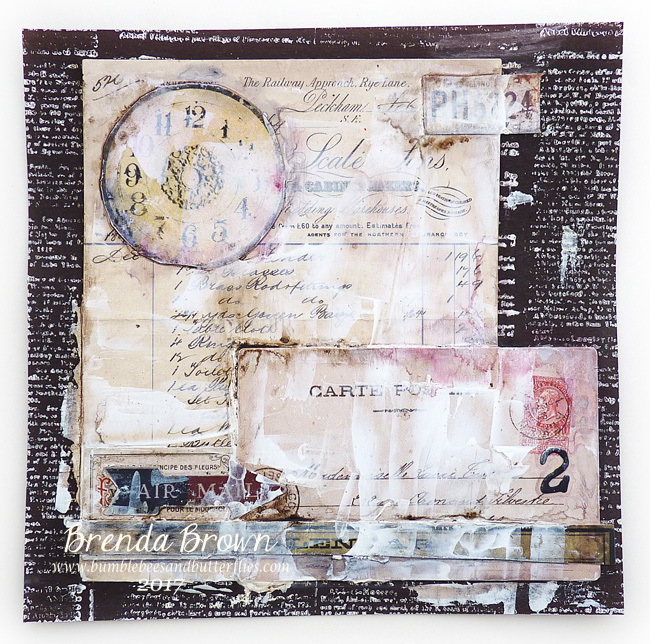 A wonderful vintage piece Brenda. wow! 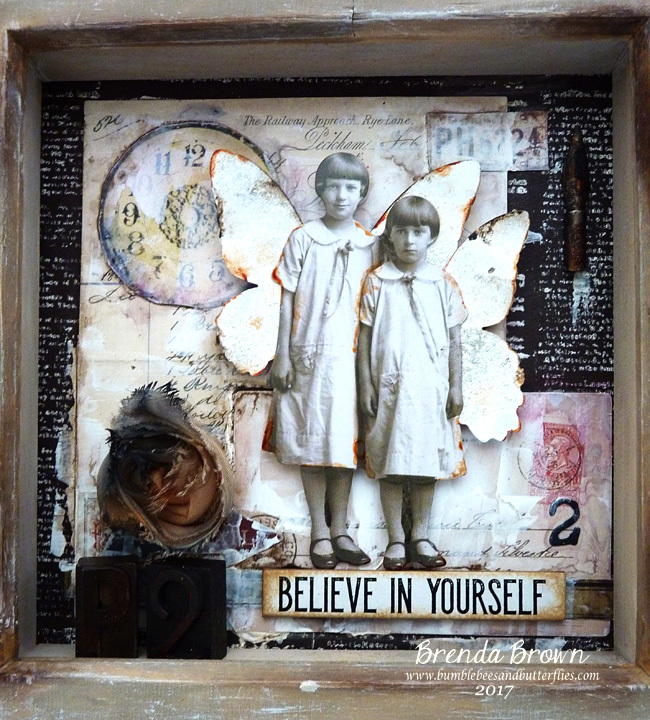 Fabulous project Brenda - your usual soft, vintage style - I love it! A WONDERFUL shadow box ... AMAZING! What a stunning piece! Adorable! That is stunning Brenda ! Love it ! PS. I hope your leg is getting better ! 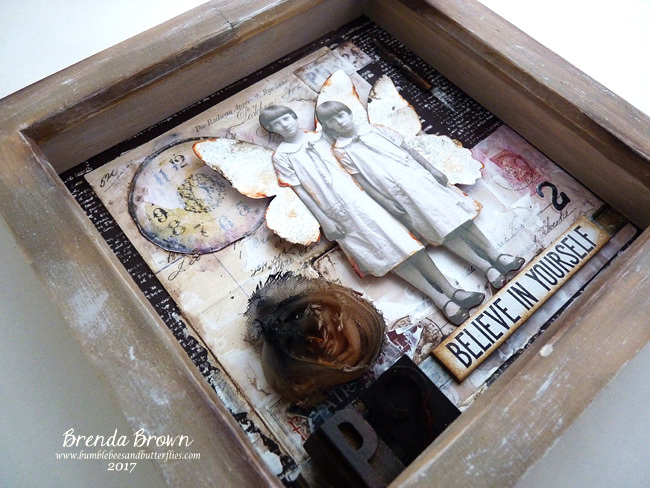 Its a fabulous project Brenda, great details and wonderful colour tones. This is fantastic, Brenda! I love the angel wings on the girls and the background you created. Simply stunning, Brenda! 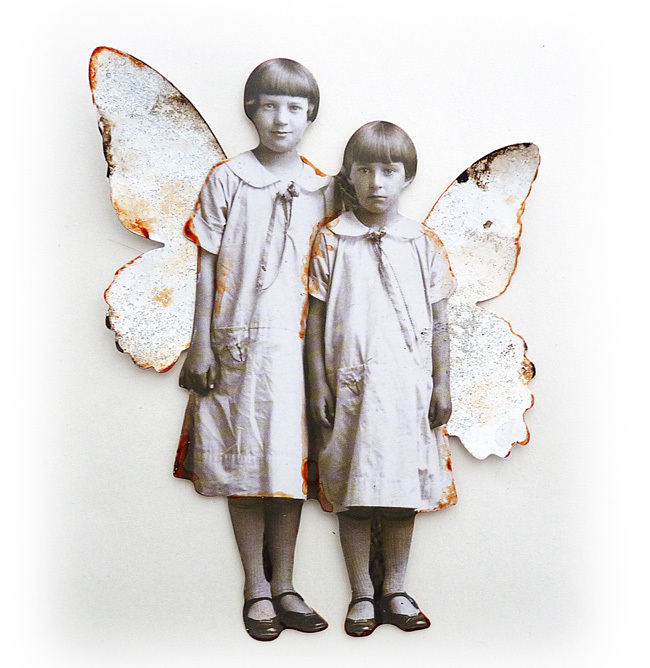 I just love your slightly rusted girls and their slightly rusted wings - such a cool effect! And the layers and composition which make up the whole piece give it a wealth of detail and story to be imagined. Glorious! 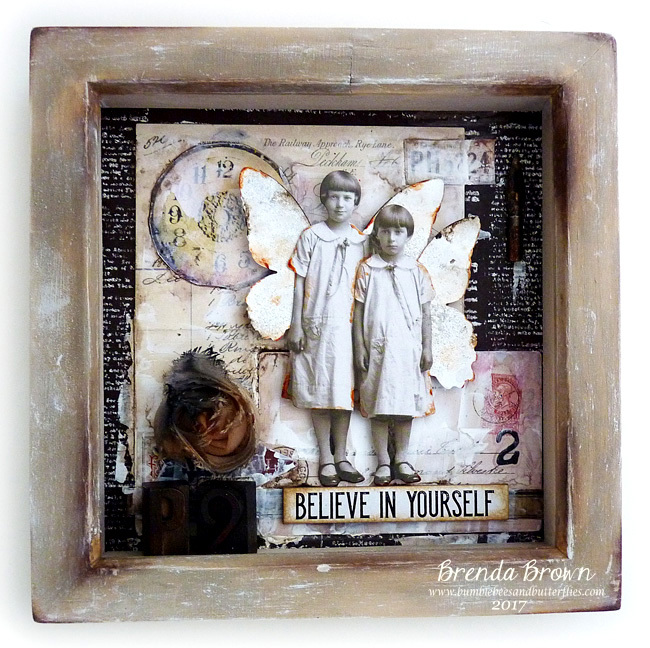 Brenda, this project is simply adorable! I love these rusty wings and all the vintage details - wonderful! Dear Brenda, I was so very busy the last few weeks, that I didn´t have too much time for the www.. I saw, that you hurt your foot so bad - I´m so sorry for! This is Fabulous Brenda! You have such a way with combining your ephemera and elements! Just gorgeous! This is really gorgeous. I really love how you pulled all this together. The wings are beautiful.